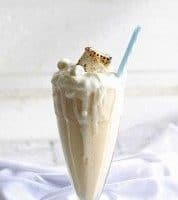 This toasted marshmallow peanut butter milkshake is decadent and can bring your mind back to warm summer nights even in the dead of winter. Back in the day, there was a hot dog stand near my Chicago neighborhood called Toots. It was more or less a shack. Who am I kidding – it was a shack on the corner of two busy streets that had just enough tarred parking lot to fit a drive-through window and 4 parking spots. The cleanliness of the place was probably questionable and we always joked about the sobriety of the teenagers working there. Really, though, as long as the food came out hot I don’t think anyone really cared about those things back then. Even though it has been closed for years, Toots still has a yelp page and I don’t think I’m the only one that reminisces about its past. You couldn’t go wrong with one of its hot dogs or a zebra cone. My favorite items to order were the fried cheese balls and one of their milkshakes. I tried a lot of weird milkshake combinations (adult Mexican chocolate milkshake, anyone?) over the years thanks to all of the available flavor options. My all-time favorite milkshake order was marshmallow and peanut butter and that totally inspired today’s toasted marshmallow peanut butter milkshake recipe. 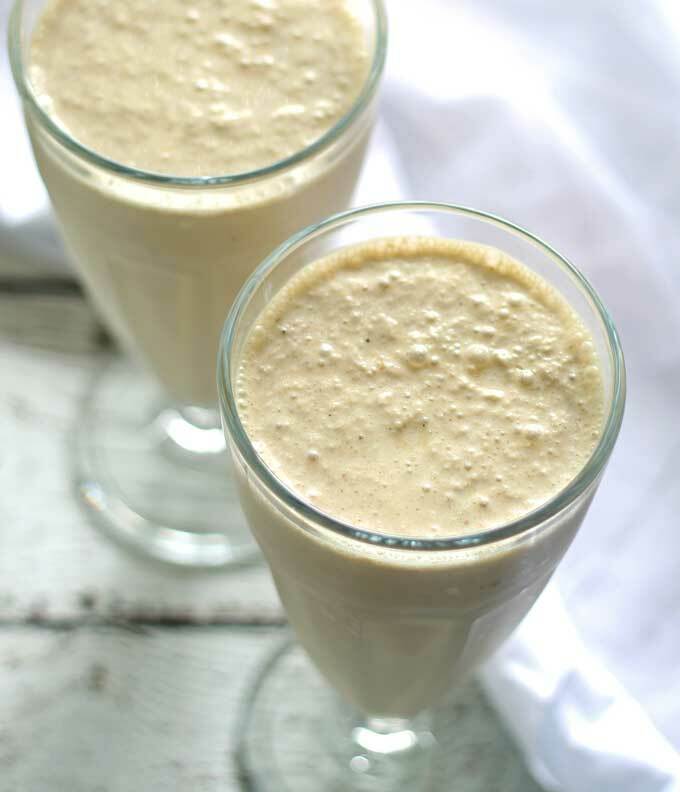 Taste testing this milkshake was a lot of fun – not going to lie, I love making milk shakes. 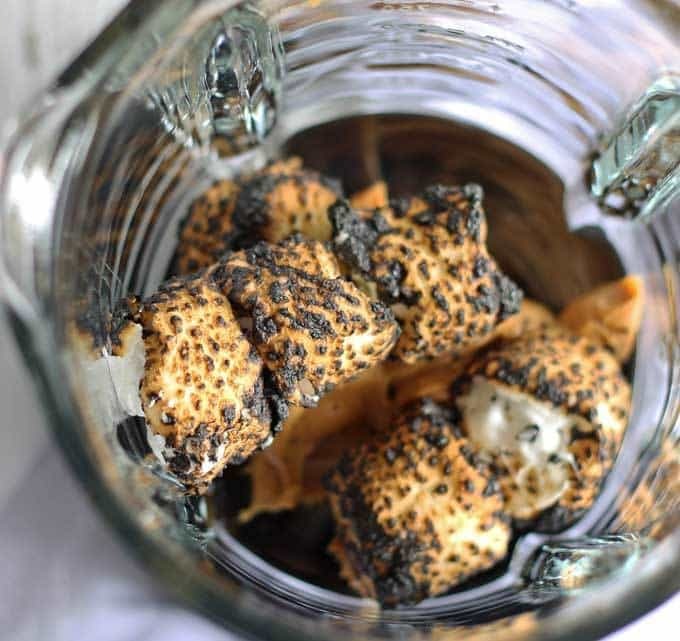 This one is pretty easy to make and the only difficulty comes from toasting the marshmallows. I start with wooden skewers that I soak in water for a few minutes so they don’t catch on fire. Then I slide the marshmallows on the sticks and toast them over my gas stove burners. Be very careful toasting your marshmallows. If you are a kid/young adult, please have adult supervision. At some point in the future, I’m going to make a video of my “marshmallow toasting process” so you can hear the smoke detector go off in the background. I usually toast 2 marshmallows at a time and then drop them right into a blender, using a butter knife to scrape them off of the skewer. 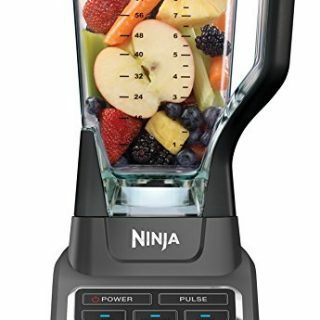 Follow with the rest of your ingredients and blend until smooth. Top with whipped cream and a few marshmallows – you could even toast some extras just to drop on top! If you want to add some syrup, you can easily make peanut butter syrup by combining 1/2 cup of honey and 1/4 of peanut butter in a small pot over low heat. Stir until well combined and then let it cool before using. 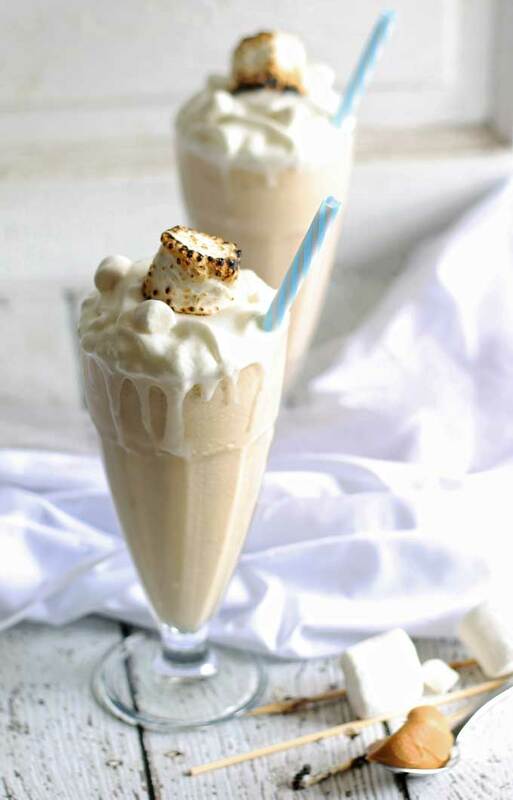 This toasted marshmallow peanut butter milkshake is decadent and can bring your mind back to warm summer nights even in the dead of winter. 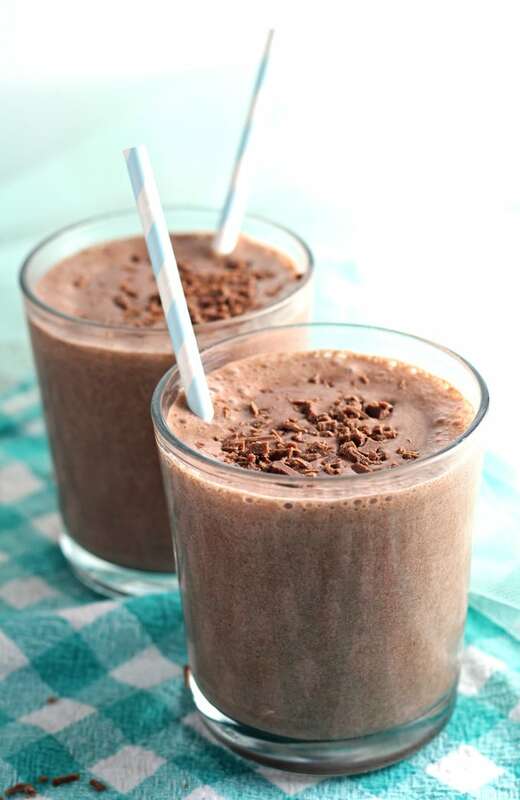 Make this delicious dessert beverage today! 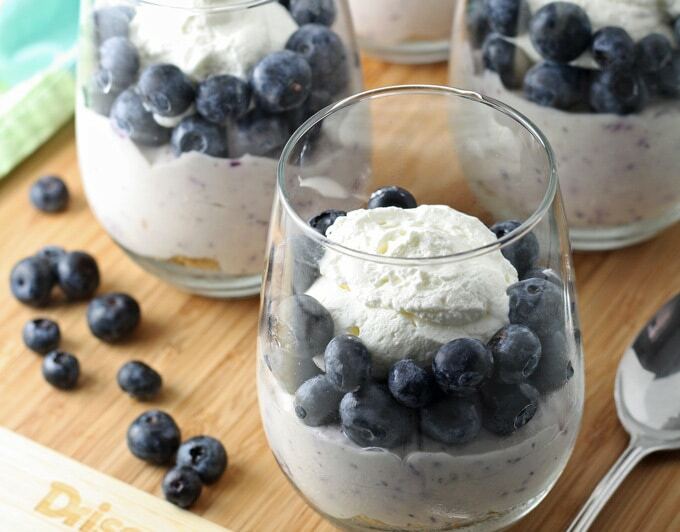 or these no-bake blueberry cheesecakes! Wow this looks so good! And those are two flavors I definitely would not have through to put together, but it sounds delicious! Sometimes it’s those hole in the wall questionable restaurants that you find the best foods at. 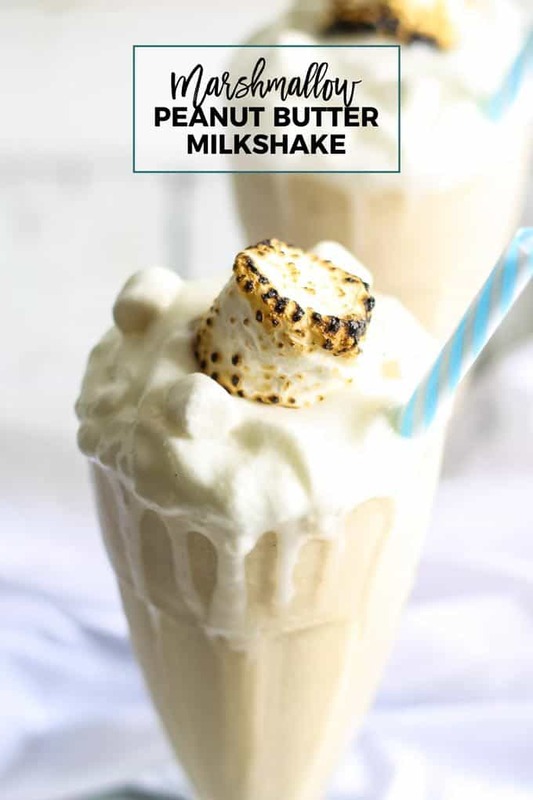 This milkshake sounds so good! I love that toasted marshmallow and PB combination! Thanks Danae!! I’ve been trying to go to more such restaurants, looking for my next fave!! 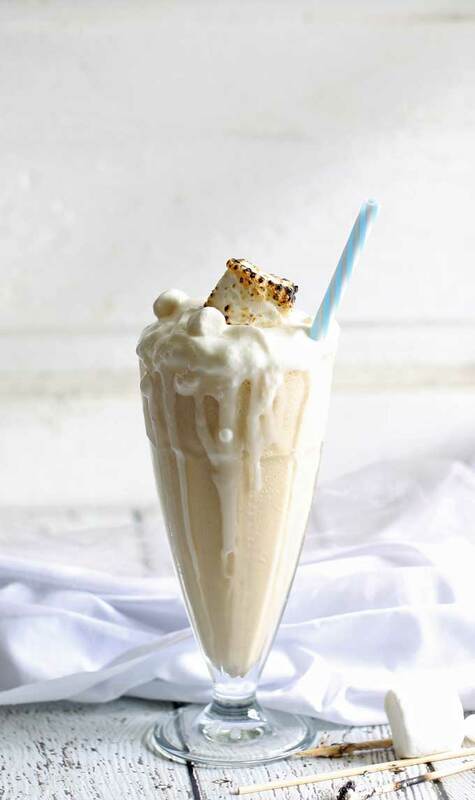 That marshmallow would not have made it through the photo shoot with me 🙂 This shake looks amazing! Haha! I bought an extra bag of marshmallows just for that reason… Love me some toasted marshmallows! I might actually die. This looks incredible…making it ASAP. This looks phenomenal Jenny, plus it’s easy to make too!! Absolutely yummy 😀 I love the Toasted Marshmallows. 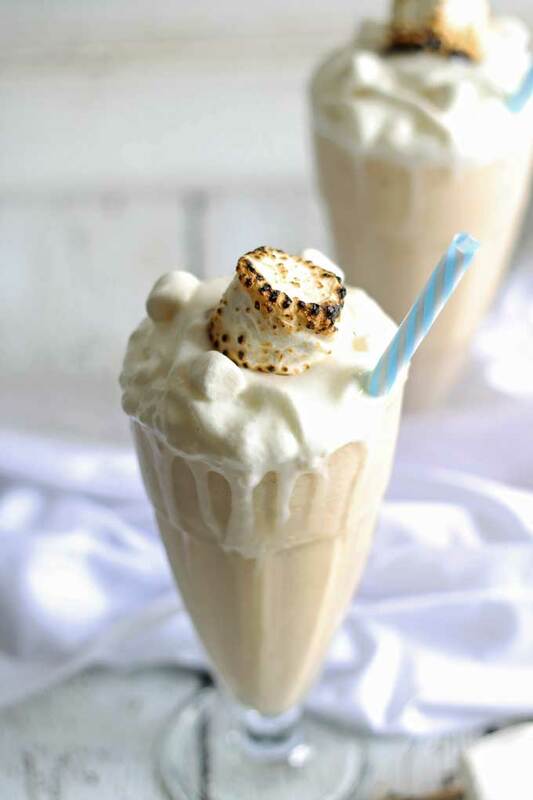 Toasted marshmallows and peanut butter in milkshake format? GENIUS. And it looks amazing too. Holy wow! Seriously what a beauty! Thank you so much for sharing this at the Simply Sundays link party. Now, do you deliver? I need one. Stat! You’re the second person to ask- I think you’re both on to something! Peanut butter, marshmallow and ice-cream??????? I would do anything for a glass of this right now. Gorgeous. You had me at toasted marshmallow. It reminds me of a fluffer-nutter or that sandwich that Elvis loved! Both of which, I LOVE! This looks like a great way to get that toasted marshmallow fix without having to light a fire and make smores! Those marshmallows are absolutely lickable. Toasted marshmallows must be one of my all time favorite things. 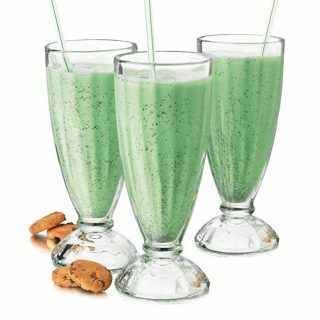 We may have to make these shakes tonight. 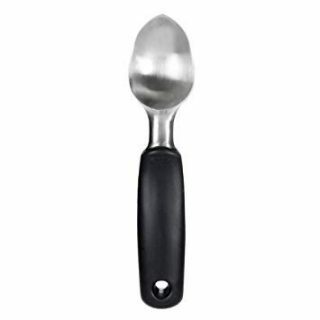 Or now. Now is good. Thanks for linking up at #SaucySaturdays. Lol, thank you Christine! I hear you on making them now, haha! Holy cow this sounds so delicious! I may have drooled! Oh, YUM, YUM! Thank you for sharing your recipe with Thursday Favorite Things! Have a blessed weekend! On mu gosh this this looks so good! And your pictures are amazing! What a pleasure to visit your site! Thank you for joining us at the Thursday Favorite Things Blog Hop! Stop by today where I have featured you on my Tuesday Treasures from the hop! Thank you so much Debi – the pictures are my labor love for sure 🙂 So excited to be featured!